Quillette has a piece up by a Cuban journalist based in Brazil, Jorge C. Carrasco, entitled 60 Years On: Reflections on the Revolution in Cuba. Sixty years ago, as thousands of Cubans celebrated the fall of Fulgencio Batista's regime, an atmosphere of hype and hatred was also overtaking Havana. 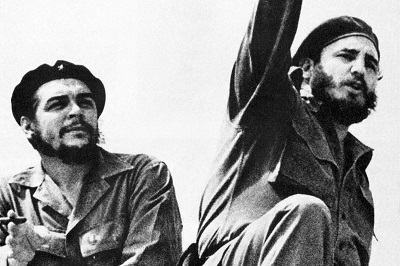 Not many people foresaw what was to come, but on January 1, 1959, the Republic of Cuba was murdered. Few tears were shed for her at the time--some were too busy desperately packing their bags, while others were preoccupied with burning cars and smashing storefront windows. The institutions not destroyed by the previous dictatorship were savagely dismembered in the following months and years by the Castro regime. . .
Fidel Castro knew that Cubans in the 1950s would not receive him as some kind of redemptive socialist deity (as North Koreans had done with the Kim dynasty). So, instead, he demanded allegiance to the Revolution itself, the romantic idealism of which masked the pitilessness of the political system that had replaced the Republic Castro despised. . . If you had a house, ate the State-rationed food, enjoyed access to free healthcare and education, then this was all thanks to the Revolution. And if you suffered or went hungry, or were persecuted and oppressed, if you denounced your "counter-revolutionary" neighbors and relatives to the secret police and pelted political dissidents and homosexuals with eggs, then this too was all for the Revolution. Every time a Cuban referred to the Revolution, instead of the Republic or the government or simply Cuba, he became more than a mere citizen--he became a soldier of revolutionary progress. Uncountable crimes were perpetrated and justified in the name of that single word. Today, "Revolution" is a word empty of meaning for most Cubans. People prefer to call the regime "the system," or "the thing." When he replaced his brother as Head of State in 2008, Raul Castro began a slow and insufficient process of reform that nevertheless significantly changed the lives of thousands of Cubans. . . But following the thaw in diplomatic relations between the US and Cuba, President Obama's visit to Havana, Trump's election, and the death of Fidel Castro, the moribund regime found itself more politically vulnerable than ever. Fearing that liberalization would awaken young Cubans and destroy the private kingdom the Castro family had built on the country's ruins, the regime's repression of dissidents, artists, and journalists exponentially increased. The arrival of the internet was delayed to prepare the conditions for online censorship and control over fledgling private initiatives was tightened. The system is once again being transformed from within in a desperate attempt to prevent the Revolution consuming itself. At the end of last year, the National Assembly approved new constitutional reforms intended to safeguard the Castro legacy for the revolutionary dynasty's descendants. Castro is right to worry. . . . This might be a good piece to share with a young Che fan you know. Might not help with fans of cop killers who fled to Cuba and such. WSJ ran a piece on how Sweden overcame socialism. Individual tax rates may still be high, but they are watching out for their corporations and reducing debt. Easier to change those kinds of things when your government is smaller, I think. I wonder if she has checked into how her model countries are doing with their radical green agendas? Maggie's Farm linked a piece on George Bernard Shaw, who was so enamored with socialism that he advocated genocide to advance it. Even after the horrors of the Nazi death camps were revealed. David Bernstein had an update this week on Angela Davis. She was stunned when an award by a civil rights group was revoked because of her views on Israel. In 1971, the CIA estimated that 5 percent of the entire Soviet Russian propaganda budget had been aimed at propping up Angela Davis -- 1 percent more than was being spent on propaganda about the Vietnam War. Details are provided in the piece linked above. Wonder how The USSR's spending on Davis compares to the amount Russia has spent recently on Facebook?